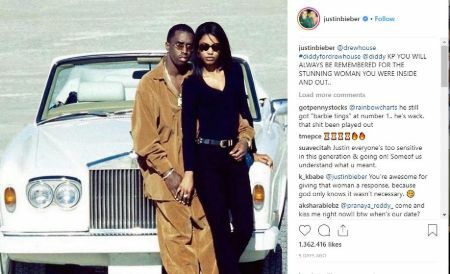 Justin Bieber has been in the headlines a lot of times lately, one for his mental health issues and now after he promoted his clothing line-up by sharing the same picture that rapper Sean Combs, P. Diddy shared while paying tribute to his now dead ex-girlfriend, Kim Porter. Several of his own fans, as well as other people, are disgusted by the fact that the Canadian singer used Death as the means of promoting his clothing brand. CAPTION: Justin Bieber shared the same picture as Diddy and reportedly promoted his product in it! Soon after he added the picture on his Instagram, fans grew outraged over his indecent charade and urged him to instantly remove the picture. After receiving several messages on the topic, Bieber took the liberty to explain himself and claimed it was never his intention to disrespect Kim and Diddy further claiming how close he is to the family. According to him, he was appreciating the art and didn't had a slightest of clue that Diddy was paying tribute to Kim in the picture. Though, people beg to differ. Given the fact how Justin often does things his own way, he is yet to remove the picture with people growing angry every day. Even his own fan are flabbergasted as, despite all the criticism, the Baby hitmaker stands firms in his ground. Speaking of the post, Diddy added the picture as a way to show his gratitude and express his love towards the mother of his four children. Diddy and late model Kim was dating since the 1990s but sadly had to call it quits in 2007. They remained close friends and after the news of Kim's untimely demise came to, Diddy took it the hardest.